Simon Sinek, author and optimist, speaks to local first sergeants and commanders at Davis-Monthan AFB, Ariz., May 2, 2018. 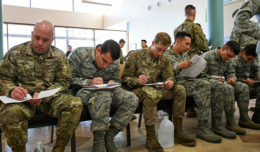 Sinek visited D-M to give encouraging words to base leadership and the Airmen that follow them. 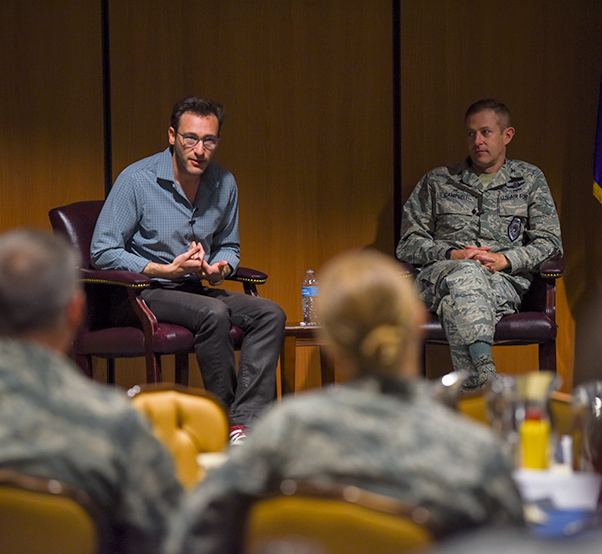 Simon Sinek visited to speak with Airmen and base leadership at Davis-Monthan Air Force Base, Ariz., May 2. Sinek is the author of several books which focus on the way leaders and followers in organizations think act and operate. 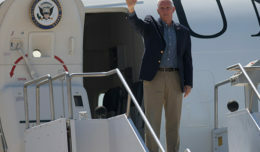 He has met with leaders and organizations to include the United Nations, United States Congress and senior leaders of the U.S. Air Force, Marine Corps, Navy, Army and Coast Guard. While visiting Davis-Monthan AFB, Sinek met with the base’s senior leaders, agency chiefs, first sergeants, and also hosted an all-call. At each session Sinek spoke about various topics such as leadership skills, the importance of a healthy work environment, the difference between infinite and finite goals and how to find ways for individuals to be inspired to work and know they are making a difference. 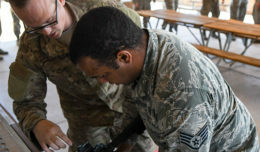 Simon Sinek, author and optimist, speaks to a group of Airmen during an A-10 Thunderbolt II static display at Davis-Monthan Air Force Base, Ariz., May 2, 2018. During Sinek’s visit to D-M, he spoke on various topics to include: leadership skills, the importance of a healthy work environment, the difference between infinite and finite goals and how to find a way for individuals to be inspired to work and know they are making a difference. Between Sinek’s speaking engagements, he was given the opportunity to fly in the A-10 Thunderbolt II simulator, tour the 309th Aerospace Maintenance and Regeneration Group and get up close to an A-10, HH-60G Pavehawk and an EC-130H Compass Call. Simon Sinek, author and optimist, flies the A-10 Thunderbolt II simulator at Davis-Monthan Air Force Base, Ariz., May 2, 2018. 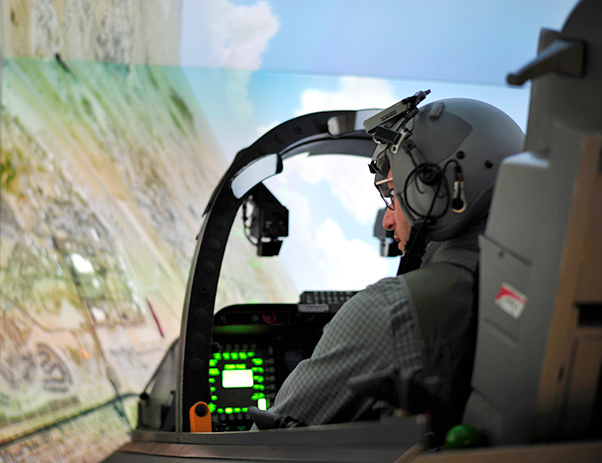 During Sinek’s visit to D-M, he was given the opportunity to fly in the A-10 simulator, tour the 309th Aerospace Maintenance and Regeneration Group and view a Desert Lightning Team static. He also met with the base’s senior leaders, agency chiefs, first sergeants, chiefs and hosted an all-call. Sinek is fascinated by the people and organizations that make a lasting impact on the world. He has devoted his life to sharing his thinking and leading a movement to inspire people to do the things that inspire them.